"This has become a must-have at Thanksgiving. It's so good it tastes like it could be dessert! Even people who don't usually like squash change their mind after trying this. It's a delicious blend of different tastes and textures. I use buttercup squash, but acorn squash can also be used; Jonathan, Rome or other dry apples work best. It can also be made a day ahead of time--just add the cornflake topping and bake the next day." Place the squash pieces in a saucepan and cover with water. Bring to a boil and cook until the squash is tender, about 15 minutes. Drain; then mash the squash with 1/4 cup butter, 1 tablespoon brown sugar, salt, and white pepper. Heat the 1 1/2 tablespoons butter in a large skillet over low heat; stir in sliced apples and sprinkle with the white sugar. Cover and cook over low heat until barely tender, about 5 minutes, stirring occasionally. Spread the apples in a 3-quart casserole. Spoon the mashed squash evenly over the apples. 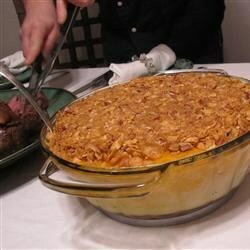 Stir together the cornflakes, pecans, the 1/2 cup brown sugar, and melted butter. Sprinkle the cornflake mixture evenly over the squash. Bake in the preheated oven until heated through, about 15 minutes. The squash for this recipe can also be baked in an oven, or cooked in a microwave. It is also a great way to use leftover squash. Wonderful!! Even my kids ate it. Next time I will dice the apples instead of slicing. And will mix in. Some spoonfuls did not get down to the apples on the bottom. This is wonderful! Of the 8 dishes served to 12 people, this won the prize! I used butternut squash and followed the recipe with no changes. Unbelievably good!